It is immensely unfortunate to read this from someone like Dr. Pielke. I actually clicked on the link twice to verify that it was really from Pielke. The combination of such a ridiculous short-term cherry-pick and deliberately ignoring the barometer-adjusted trend is something we would expect on politically-motivated blogs of much poorer quality. His argument on Arctic sea ice is even worse – a shameless act of desperation. Pielke Sr. has been a skeptic I’ve paid attention to over the years but I’ve seen a gradual trend towards these sorts of blurbs from him recently, this perhaps being the worst. I want to emphasize that it’s not indicative of the work he’s done over the years but it’s a disturbing trend nonetheless. Based on his last comment, I can’t help but to think the recent U.S. political shift is leading towards a degradation of the quality of his arguments and bringing out potentially truer colors. Regardless of intent (which is speculation), this is actually quite depressing to me and I say that with all sincerity. >>say starting in June 2007, which gives 5.3+/-2.2 mm/day! Is this right! The year and a half through the end of 2008 would then yield a SLR change of almost 2 meters! I’m feeling diplomatic, and might give Pielke Sr the benefit of the doubt that he simply interpreted your statement differently than it was meant. He seems to think you meant trends in those observations have accelerated in the last couple years, not that the longer-term trends are faster than the previous expectations. In which case he is discussing oranges, and you are discussing apples. You can say that discussing oranges (looking for trends in just a year or two of noisy data) is always pointless. You accuse him of bringing up oranges, when maybe he thinks you brought them up first. Sadly, one would almost have to assume this post was bait for such high quality papers as the SF Examiner. Anyone else find it ironic that Tomas Fuller linked climatesci (and CA) in his post today? Hook line and sinker. 2. Another ludicrous sample period. 3. An absolutely preposterous sample period. It’s as if the fact-inventors are experiencing a paucity of imagination, but alas that wouldn’t be news. Can you point me to cloud model from first fundamentals that works on small grid sizes? Make it four: blogged about it. Maybe five: trusted someone who agreed he was right and blogged …. At first blush, Climate Sci doesn’t look very thoughtful or informative to me. Minor typo: “But again this not relevant” should be “But again this is not relevant”. Thanks again for all the good work. The lack of serious content in the vast bulk of the inactivist material for me is a very strong indicator that there is no serious case that the mainstream science is wrong. Recently someone mentioned the “HIV doesn’t cause AIDS” pseudo-debate. Although that also had many uninformed hangers-on, it had a few serious scientists at its core, some of whom wrote papers that took a reasonable degree of medical knowledge to see through. This stuff is just pathetic. Even a non-special-ist can easily see the problem. It’s sad that so many mainstream media outlets keep propagating it. Gavin, I caught the last part of your interview this morning on KBOO radio then listened to it all when I got home (here). Part of your book tour? ;-) I was impressed by how well you were able to explain the issues in plain language and how you handled the more out there speculations KBOO is know for sometimes. Sort of like your rebuttals of Dr. Pielke in this post. BTW, you first caller (cell phone towers) is well known to regular listeners of the station as is Jeff (Waxman-Markey). Hank: If it were Monckton, I’d not be charitable. But Pielke surely knows better than to make some statement of trend based on “an absolutely preposterous sample period” of one year, as Daniel Goodwin puts it. In the interest of civility, I think we should await Pielke’s response before heaping abuse on him. My guess is that none of this happens if the original RC post had links to the figures above. I grew up in Corvallis. Will there be any public sessions? Oh, indeed not. The uncertainty in the data, over time periods as short as Mr. Pielke (so carefully) chooses, render his statements irrelevant. I believe Mr. Pielke is a good enough statistician to know this. More seriously, he attributes such misunderstanding to realclimate. Which I suppose is why we have this post. Mr. Pielke fails also to point out that the 2007 AR4 by the IPCC was based on papers published years earlier, and elides over the “was expected” bit in the sentence in the realclimate post. I would be more likely to say something like “Hexapodia is the key insight.” Which would be about as relevant, and less misleading than Mr. Pielke’s screeds. I just wanted to offer an anecdote to illustrate the (possible) value of your work on this website. I own a PHEV Prius and regularly post on priuschat.com. There’s a section on that site for environmental issues. There’s a guy there who routinely posts the denialist party line, for whatever is current. And yeah, this came up. Thanks to you, I had a ready response. Fully understanding that what I do is just amateurs talking to amateurs, it still serves a purpose. If denialists are going to be out there pumping out disinformation, those of us with good sense need to have people like you around, to provide reasoned information. Otherwise, the undecided will see nothing but the nonsense. Based on your last post, I am sure that, at times, it must seem to you that you are wasting your time responding to the same nonsense over and over. But the fact is, in terms of impact on public opinion, I think there is value in immediately responding to the latest baloney being spun. Yes, you are at a disadvantage. There is a near-infinite supply of plausible bullsh*t in this area. But, because dittohead denialists spread their fertilizer based on the most recent postings, I believe there is a real, huge value to your addressing those postings straight-on. Thank you again for the work that you do, both the real science, and this website. Ah, actually, this comment was for your prior posting, but … I think I must have submitted it as the website was being updated. Please move it, otherwise delete it, as it has no bearing on this post. I get angry that pseudo science hijacks the discussion, drawing you into correcting their manufactured debate. The scientific questions on climate I really want to read about are simple: How bad? and How soon? Models and scenarios deserve constant update to reflect changing rates of change. This is much more exciting. This sort of “what” and “when” can fuel endless discussion, and it can rigidly adhere to science and can showcase valid scientific differences. And such topics are far more worthy of your time than publicly trying to re-educate misguided and deluded researchers in the fundamentals of the scientific process. This is like publicly dressing down an errant student for plagiarism. Other students in the class know the rules, know it is a necessary to call attention to them, but we are eager to move along and get back on topic. I agree with Christopher Hogan. Sites like this are critical for amateurs who want to counter the bubkes being spewed out over the internet. I have never convinced a denier of the errors of their ways but I have managed to convince fence sitters that the science is clear and that the denier tactics to cast doubt are just smoke-and-mirrors. Keep up the good work, it is important. I found this posting especially useful and interesting. It was very helpful for me to see graphs of the trends being considered. I am a scientist who has been reading and learning about climate science, but I do not have the time to become familiar with the primary literature or to know much about specific data sets. I pay attention to bloggers who have science (especially climate science) credentials. Pielke gains credibility with me, since he is actively publishing in climate science. I have read some of his skeptical posts and must admit that I am not able to find fault with his arguments, although I know that his views conflict with those of (many) other researchers. This contrasts with posts by Roy Spencer, for example. In his case, I can find points that seem deliberately misleading. I can’t comment on Pielke’s motives, but I must say that the points made in this posting must be embarrassing to him. This exchange points to how easy it must be for average citizens to be confused and mislead in the broader debate about climate. The only hope may be that a major of our political leaders and citizens assume that scientists and the peer-reviewed literature represent the best available knowledge and that they listen to scientists for guidance on what this literature says. I will try harder to provide an understanding of the peer-review process in my undergraduate classes. Hats off to whoever wrote that..
Gavin, been listening to your KBOO interview – thought I was listening to England captain Andrew Strauss for a while, you sound rather similar. Hello, a lurker, or troll here if you like, very interested in your response to Pielke Snr. Isn’t it true that we, the general public needs to know the truth about climate change and its impact on us all ? Isn’t it true too, that Al Gore and others who preach climate catastrophe have overstated their case ? I have not burrowed into your archives, but tend to a sceptical opinion of politicians who warn of disaster, and think that it may be possible that they have political reasons for doing so. You perhaps may feel this way too, and may have written and posted about Al Gore’s overstatements, (lies may be a bit harsh), but Sir if you have, I would be most interested to be told. In the meantime I remain a sceptic / denier if you like, and would appreciate your comments. It is Pielke (not Daniel Goodwin) who speaks about a one-year trend. A quick look at any graph showing the evolution of the Arctic sea ice clearly shows that one year is an absolutely preposterous sample period (because of the short-term variability you always find superimposed over the underlying trend). #12 tharanga: “we should await Pielke’s response before heaping abuse on him”. Pielke’s points are clearly stated on his blog post, as well as on this RealClimate article. The original RC post just highlights some real objective facts. If you don’t know what the real facts are (i.e. how to get a real trend) or where to find it out, it is not RC’s fault (in fact you can learn a lot about that by reading other RC posts), and, of course, it doesn’t entitle you to make trends up and spread it among the (already sufficiently “disinformative”) denialsphere. Maybe I’m on my own with this thought ? But perhaps referring to Roger Pielke Sr’s work under the title of goat s..t (ie: meaning of the word bubkes) didn’t sit too well with Roger. Also, on the small chance that temperatures/ sea levels/ sea ice remains stable (or falls) for an extended period into the future, you can be sure that the bubkes comment will end up coming back to haunt in larger animal form. Personally I’m slightly nervous that temperatures have flattened off right at the time we seem to be entering a new low solar phase. Surely this is just a coincidence ? Roger Pielke has closed the comment section of his post. That tell at least that he is not willing to allow a debate on his findings. Not very scientific. Over the past few years and especially in the last few months, journalists have consistently misinterpreted reports’ and studies’ results in exactly the same way as the phrase “Some aspects of climate change are progressing faster than was expected a few years ago” is prone to be, evidenced not only in the their headlines, by also in the bodies of their stories. It’s unfortunate that Pielke has a “no comments” policy on his site, since (a) one can’t address his points at source, and (b) I suspect it lends itself to a rather bombastic style unconstrained by any possibility of criticism – if no one has an opportunity to address his arguments, there is little imperative on his part to be careful to make reasoned and scientifically-valid arguments. In this blog page Pielke attempts to ridicule the GISS modelling of upper ocean heat content by asserting that the accumulating ocean heat content must satisfy certain criteria as “a requirement to NOT reject the IPCC claim for global warming“ Thus, for example, the added upper ocean heat content must be (according to Pielke) at least 13 x 10^22 J by the end of 2008, and he asserts elsewhere that the upper oceans should have acumulated 5.88 x 10^22 J in the period end 2002 to end 2008 (if Hansens radiative imbalance GISS model projections are to be satisfied). He then proceeds to ridicule the modelling with a list of years 2003, 2004, 2005, 2006, 2007, 2008 each with “~ 0“ as their accumulated heat content! However if we compare Pielke’s proscriptions with the Levitus data (see graph in the top article of this thread under section 2. 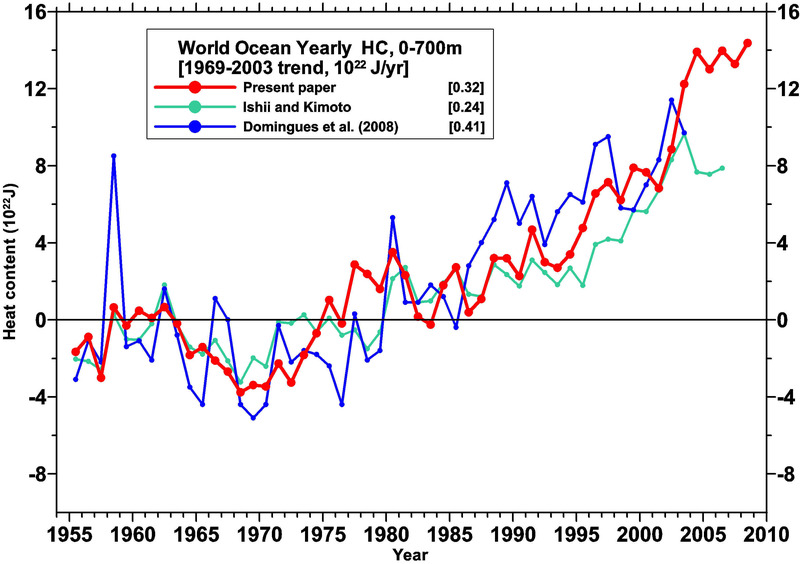 Ocean heat content ), we find that the accumulated heat in the upper oceans is around 14.5 x 10^22 J at end 2008, and the accumulated heat in the upper oceans between end 2002 and end 2008 is close to 5.8 x 10^22 J.
I notice Pielke’s Blog is titled “Roger Pielke Sr. Research Group News”. Does anyone know whether the other members of this research group stand behind these unscientific claims and unfounded attacks on colleagues? The heading does clearly seem to imply that Pielke is not just speaking for himself. A fantastic read once again. The consensus lives on and on and on stronger than ever from real scientists doing real science. Surely its time to somehow out a stop to all this errant nonsense but the sites such as CA and WUWT seem to thrive as they get more shrill. However maybe more shrill means more desperate and the end of their debacle is closer then ever. Lets hope so. Christopher Hogan in #15 illustrates a tremendous benefit afforded by this site. It allows those whose specialty is not climate science to discuss the issues of AGW intelligently with a wider audience. Most people are busy and have only limited time to devote to any issue. They read the paper, watch the news and gather that the topic is complex and differing opinions exist. RealClimate is an invaluable resource for allowing its adherents to educate the general public on climate science and AGW and expose faulty reasoning from whatever source. I know that many regular readers are frustrated at continual refutations of junk science. Bear with it. An equity funds management CEO recently told me he was very dubious re AGW. He was acquainted with dissenting opinion from his reading of financial journals and more importantly to him, he was not seeing the economic responses he would anticipate if the problem were genuine. I was able to discuss CO2 lag, GHG forcing and its relative size to natural variability meaningfully with him. Was he convinced? No. But I believe he has moved from a 2 to a 3 with respect to his understanding. RealClimate allows its readers to slowly shift the general populace in a direction informed by quality science. RC – thanks so much for this post! I actually felt a little bad bringing up Pielke Sr’s comments (in #368 in the RC post “A warning from Copenhagen), but now that I see how convincingly you’ve been able to answer his charges, I’m glad I did! Chalk one up for the dark side I guess. I’m not from the US however clicking a few links on Pielke’s site that relate to the EPA endangerment thing reveals his politics. In particular I note he brings up the nonesense about the IPCC reports not having been independently reviewed, a point that made me laugh when I read it in Carlin’s report but it made me cringe to hear it from a scientist that I know has enjoyed some respect on this site. It seems clear to me his political opinion has triumphed over his scientific training. Sad to say but I predict he will be a star attraction at a future Heartland climate confrence. Gavin, the sentence “Some aspects of climate change are progressing faster than was expected a few years ago” strongly suggests that it is the data from the previous few years what allows to conclude that everything is progressing faster, as only with the data you can see how well or how bad it progresses. Pielke just points out that the data from the previous 2 years does NOT support that conclusion, which is a correct afirmation for all of the issues involved. You can say that 2 years of data are not statistically significant, which is true, but that works in both directions, you definitely cannot use the data of the recent years to claim that the trends are rising. You can avoid using that data or drawing conclusions about it altogether, but you cannot draw a conclusion which is opposite to what they actually suggest. And what the previous 2 years of data suggest is a smaller trend for the sea rise, a non-significant change in the oceans heat content, and a recovering Arctic sea ice. As Pielke says, this may be a temporary disturbance and the trends may increase again later on, but claiming that the recent data is more worrying than the previous data is entirely wrong. It is like last year’s Pachauri’s speech in Australia saying that “the global warming is accelerating”. It was a very strange use of the present continuous tense, as it cannot make reference to the last 10 years of well-known data. These 10 years may be not important or not significant, but they definitely don’t allow you to claim any sort of recent acceleration in the trends either. If you use them, it has to lead to admiting less warming. There seems to be confusion about trends, projected trends, and actual observations. I read this statement as saying that since the last data used for IPCC 2007 report that sea levels have risen faster than expected, that ocean heat content has risen faster than expected, and Arctic sea ice has shrunk faster than expected. 2. When someone says that climate aspects are progressing faster than was expected a few years ago, it sounds to me like that verification of that statement would consist mostly of looking at the effect of adding recent data. Correct? 3. 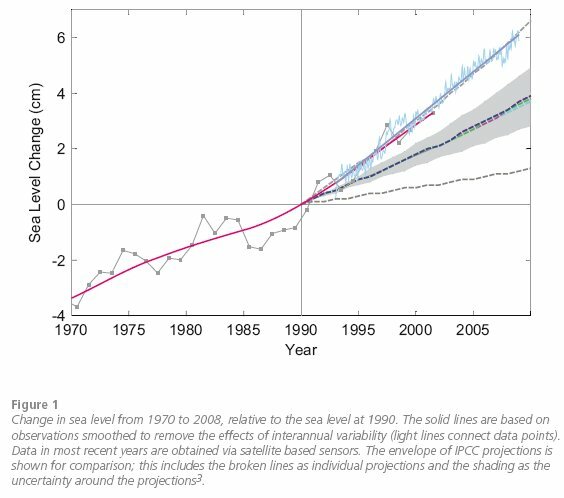 Are the climate aspects under consideration — sea level, ocean heat content, Arctic ice extent — aspects where recent data that fall beneath the trend line would cause us to believe that those climate aspects are progressing faster than previously projected ? It appears to me that Stefen set up the conditions by making a statement that exceeds what available information supports. The attacks on Pielke about cherry picking and inadequate smoothing seem strange, since he’s trying to refute a statement by Stefen about what has happened in the last few years. Evaluating a statement such as “Some aspects of climate change are progressing faster than was expected a few years ago – such as rising sea levels, the increase of heat stored in the ocean and the shrinking Arctic sea ice.” necessarily require short smoothing periods. Global warming is scary enough without overreaching beyond the supportable facts. Obviously Pielke has interpreted this as saying that the author of this blog has claimed that some physical aspects of climate change are occurring faster than the projections of a few years ago. To test the accuracy of that statement, one would naturally look at recent data in sea level, ocean heat content, and Arctic ice extent to see if indeed they are changing faster than expected a few years ago. Of course, never having published a peer-reviewed article on climate, there may be ways that I am unaware of where deviations over the last few years from an expected trend line will move the trend line in the opposite direction. Nope, it requires that you have more data. If you use shorter periods, you MUST (and this is one area where Pielke shoud [note ***should***] have known better) increase your uncertainty or decrease your confidence. In a way, I sympathize with Pielke . It can’t be easy even to pretend to do science when all the evidence is against you. It leaves you with no weapons but rhetoric and outrage. Given that Pielke has shown no talent for weilding either, it’s a pity he didn’t stick with science. Science is easy by compared many of life’s endeavors. If you stray, the evidence and your fellow scientists are always there to nudge you back onto the path–none to gently. It is a pity Pielke stopped listening to the evidence. OK, OK. So this would not only require a misinterpretation by Pielke, but also a spot of laziness as he didn’t look at the report to see what you were talking about. I was trying to be nice. It is rather odd on his part – there are many, many posts on this site chiding people that putting a trendline through 5 or 7 or 8 years of noisy data is not meaningful. How he could look for a trend in 3 years, or less than one year, find a little wiggle in the noise, and think the wiggle was worth talking about, or that anybody else was talking about the wiggle, is beyond me. But he does read this site, so hopefully he will come by. Nope, you can have better models. Better limits on the power of the changes (if you had a minimum CO2/temp sensitivity of 1.5C/doubling and then changed it from observation or model to 2.5C/doubling, the warming is progressing faster than expected before then). And he’s right. That’s the claim. In regard to *trends*, not individual cherry-picked data points. Roger’s a scientist, and claims to be writing from a scientific perspective. He knows better. Gavin, I just listened to your radio interview. Good stuff! You mentioned (in response to a caller’s question) that although temperatures in the arctic are rising rapidly, there’s as yet no sign of an increase in atmospheric methane, its level having been stable for about a decade. But according to Rigby et al. 2009 (GRL, 35, L22805) there’s renewed growth of methane concentrations starting around early 2007. I’ve also taken a look at all the methane data I could get from WDCGG, and it appears to be quite real and significant. REGINA, Saskatchewan, July 2 (UPI) — A severe drought is bringing havoc to grain and livestock farmers in Canada’s prairie provinces of Alberta and Saskatchewan. Nine counties in southern Alberta have declared emergencies and imposed watering restrictions and open fire bans in response to the dry conditions also plaguing western Saskatchewan, the Globe and Mail reported Thursday. One Saskatchewan researcher, Dr. Dave Sauchyn of the University of Regina, told the newspaper it’s likely part of a larger trend. What could be forcing this? What about the other hemisphere? More evidence of a developing El Niño event has emerged during the past fortnight, and computer forecasts show there’s very little chance of the development stalling or reversing. Responding to continued weak Trade Winds, equatorial sea-surface temperatures are now more than 1°C above normal in the eastern half of the Pacific. Although it has risen in the past fortnight, the Southern Oscillation Index (SOI) remains below zero at around −2. Another adverse sign for southeastern Australian rainfall is the recent trend to positive values in the Indian Ocean Dipole (IOD), as measured by the Dipole Mode Index (DMI). Notice also that the recent La Ninas did little to alleviate Australia’s drought – and it may very well be that this El Nino will do little to alleviate drought across the southeastern U.S. as well. Wait and see – but ENSO effects in a warming world are not the same as those of the pre-industrial ENSO, that’s obvious enough. Charlie – if you think a trend can be demonstrated by less than a year’s data, then yes, Pielke Sr. has a point. If you also think it is acceptable to pick two arbitrary points in the data and draw a conclusion from those two points, then yes, Pielke Sr. has a point. If, on the other hand, you think it necessary to follow centuries-old scientific conventions, and avoid cherry-picking data, then you cannot possibly accept that Pielke Sr. is doing anything but grandstanding. Have you actually read Tamino’s excellent analysis of noisy trends? Do you understand the difference between noise and signal? If not, please read some more and come back if there is anything you still don’t understand. Have to add a minor point – artic ice coverage (area) is partly a red hearing – the total ice (defined as volume) is the real issue. None-the-less short time trends on artic ice volume do matter very much. Once the ice is (mostly) gone during late summer, big effects begin that will drive world climate in a very serious manner. CTG, #46, actually wrong. You can’t get a trend of annual temperatures from less than a years data. Since there is no year. You cant get a trend from two arbitrary points. What you CAN do is put out a number that says what the difference is between those two values. But though this can be done, this is not a trend any more than the laden speed of the European Swallow indicates your favourite colour. What is the data that supports the original statement being discussed: Some aspects of climate change are progressing faster than was expected a few years ago – such as rising sea levels, the increase of heat stored in the ocean and the shrinking Arctic sea ice. ?? For this statement to be made with such confidence, we must have seen some very significant recent rises in sea level, correct? Or is it a case that over the last few years that we have done further analysis, adjustment, and correction of past data such that we now believe that the sea level is rising much more rapidly than we believed a few years ago? The comments about short data period, increased uncertainty and decreased confidence apply to the original statement which asserts a fact. IMO Pielke’s comment is simply saying that the recent data doesn’t support a high confidence, low uncertainty statement that sea levels are rising faster than expected, ice extent is shrinking faster than previously expected, and ocean heat content is rising more rapidly than previously expected. No, only trends that have proven to be higher than those that were projected (“expected”) a few years ago, as the copenhagen report, the post you’re responding to, and common sense say. You can claim ignorance for yourself, i.e. that you don’t understand that only discussions of trends are in any way meaningful, and therefore the original statement is clear within the context of discussing climate. But you can’t claim ignorance for Pielke, Sr. Well, you can, but if he’s truly so ignorant why should anyone listen to him? BTW someone over at Deltoid has come up with the same argument, so obviously this is becoming the cut-‘n-paste spin du jour.